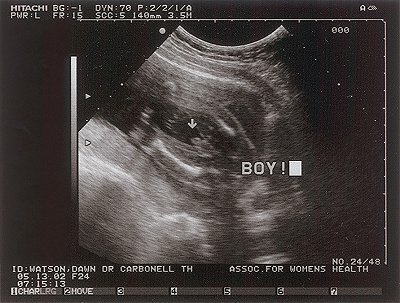 OK, we went to the Dr's today and they concluded that it was a boy. He wasn't shy about much and even seemed to grab his unit at one point (which made everyone laugh). I'll post pictures shortly. 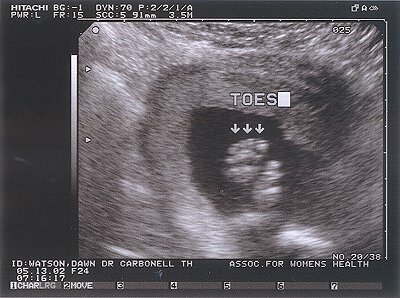 Here's the ultra sound pics. That is a boy part. 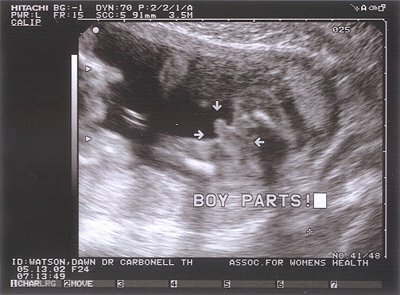 Yes, it is true, I shall be having a son. I suppose at this point it would be important to start figuring out what this poor kid's name is going to be. If you have some brilliant (or other) ideas, please send me or Dawn and e-mail. Just for confirmation they gave us two pictures of his man unit, which he promptly grabbed shortly after this pic. 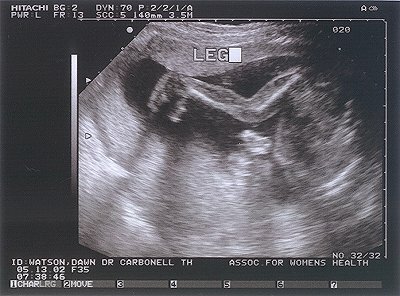 Of course, this will probably just piss big Joe off since he was throughly convinced we were having a girl. Hahaha. Oh yeah, and FYI, Lisa's mom was right. And look the kid has all 5 toes. Actually, they checked out his toes, his nose, his head, hands, spine, parts of his brain, abdominal cavity, legs (getting to that), kidneys, heart, etc. They measured sizes of all kinds of stuff. It was quite entertaining to see how much they could review in a non-invasive way. How many things they could check for and what they could confirm. According to his size he would be due on 9/22, but they are not changing the due date because at this point some of his father's massive size has to be figured into the equation. Quite the little toy. As I said, they looked at his legs and everything. Here is a picture of one of them (I think this is the right side, the baby is upside down which he appears to enjoy and his little hand is up by his mouth). Quite the entertaining little toy they have there. Well, off to go take my mother to dinner for Mother's Day (since we missed doing that yesterday). The baby has been kicking quite a bit, but only Dawn was feeling it. I actually got to feel it last night when we were watching TV. He gets active in the early evening and whenever you take him for a ride in the car (of course, I don't get to find out then, since I'm usually driving). On other news, it looks like his name will be Adien John. Adien or Adian is Celtic for fire. It is also linked to Scottish or Irish for firey one. John comes from my Grandfather John Albert Watson. This also gives him some OK initials if he chooses to go by AJ. This also has the upside of not giving him a funky middle name, since I don't know many people who actually like their middle names.